On Thursday the EIA Petroleum Status Report shows a fourth week of oil inventory draw-down with a decline of 2.8 million barrels. 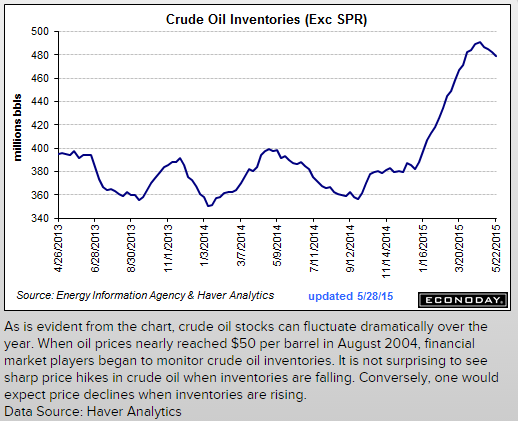 Expectations were inventories would decline 857,000 barrels. This decline occurred in spite of the continued increase in production as noted by the orange line in the below chart. Notable in the chart is the fact production continues to increase in spite of the sharp drop in rig count (blue line). The recent inventory draw-down may be due to seasonal factors as the busy summer travel season approaches as well as temporary production declines in sand fields in Canada. "Stocks close 1% lower as Dow plunges triple digits; dollar, data weigh"
As the below chart shows, the S&P 500 Index is down only 1.29% from its year-to-date high return of 3.49% reached on 5/21/2015. For the the Dow Jones Industrial Average, this index closed down almost 200 points today; however, as the market index value becomes a larger number, 100 or 200 point movements are not significant from a percentage return basis. One issue on the minds of a number of investors is the near term potential for an equity market correction. 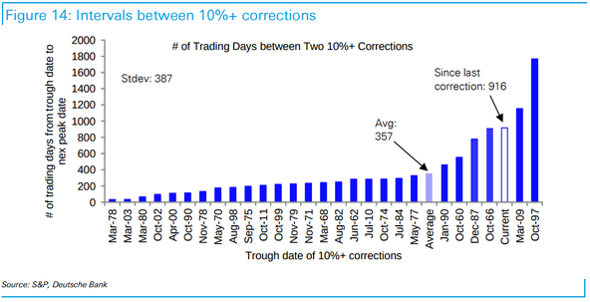 One's thinking is framed by the fact the S&P 500 Index has not incurred a 10+% correction in three and a half years or 916 trading days. This is the third longest streak as can be seen in the below chart. Include the fact first quarter 2015 earnings were not that great from a growth perspective, the economy (GDP) is growing at a snails pace and euro zone issues (Greece and now maybe Spain), it is not surprising investors are a little on edge. The disconnect between the performance of the Dow Jones Industrial Index and the Dow Jones Transportation Index has some market strategists suggesting the broader equity market is setting the stage for a correction. The correction thinking is based on the theory that weakness in transports is indicative of less goods being moved in the economy and thus a signal of a slowing economic environment. From a more technical perspective, some strategist look at the Dow Theory as being able to signal a market correction. 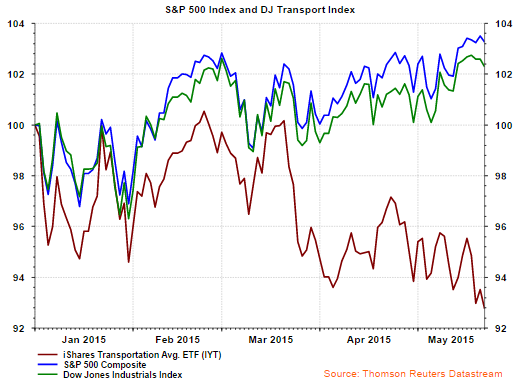 As the below chart shows the transportation index has underperformed both the Dow Jones Industrial Index and the broader S&P 500 Index. 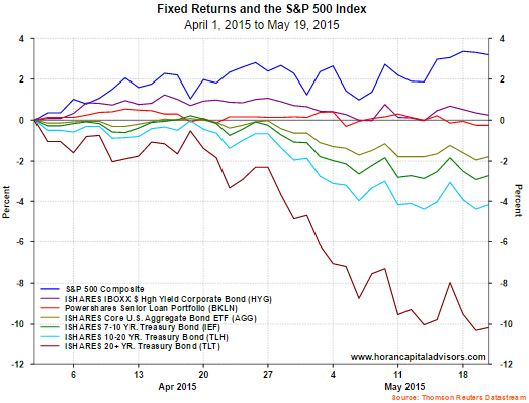 This underperformance began to accelerate in mid-March. For investors though, evaluating the actual causes of weakness in the transports will provide insight into the slowing rail segment of the market and whether these factors are broad based ones or simply industry specific ones. In our last post about a week ago we noted the slow pace of economic growth that has unfolded since the financial crisis. This slow pace of growth has resulted in the unprecedented easing programs (quantitative easing-QE) instituted by the Federal Reserve over the past few years. A consequence of these QE programs is the apparent inability of the Fed to embark on a monetary tightening path since the markets seem addicted to these programs. In our view, given the low level of rates today, an initial tightening by the Fed will not have a long lasting negative impact on the overall economy or equity market. With this said, market participants were looking for insight into the Fed's future monetary direction with the release of the Fed's most recent meeting minutes. As was true to form, the Fed seems intent on maintaining its near zero interest policy with a June rate hike most likely pushed back to later in 2015 or maybe 2016. This delay in raising rates may give the market a reason to push bond prices higher (interest rates lower) near term. Leading up to the release of the April minutes, the bond market positioned itself for a potential rate hike in June. As the below chart shows, from the beginning of April through the market close on May 19th, treasury bond ETFs sold off significantly. The aggregate bond index was also a weak performer and traded down nearly 2%. 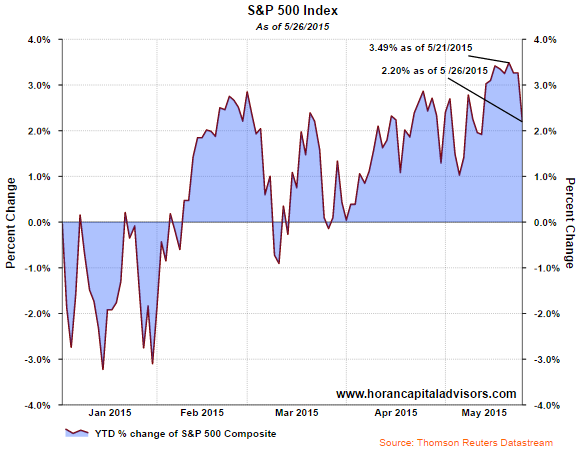 Stocks (S&P 500 Index) on the other hand have generated a positive 3.2% return since April 1st. 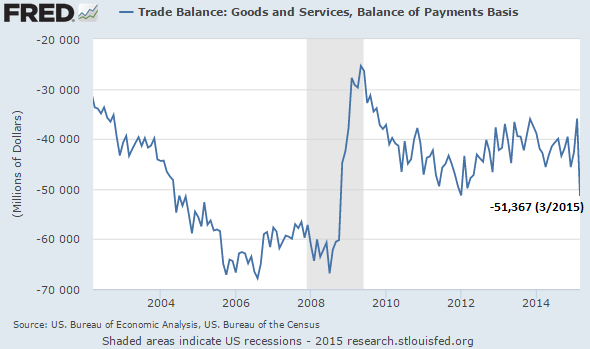 The March trade deficit grew to $51.4 billion which has many economist now predicting subsequent revisions to first quarter GDP will show the economy contracted for the first time since contracting -2.1% in the first quarter of 2014. In the first quarter the advanced reading on GDP or economic growth was reported at .2% which was below an expectation of a Q1 growth rate of 1%. The large increase in the trade deficit is being attributed to resolution of the West Coast labor dispute resulting in a spike in imports and to U.S. export headwinds due to the strong dollar. 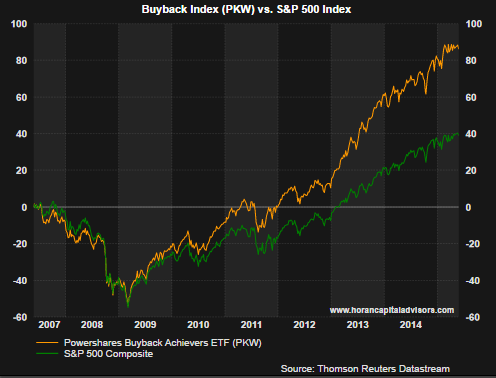 In a post last month we highlighted the fact value strategies and dividend paying strategies were lagging both the S&P 500 Index and the S&P 500 Growth Index over the past twelve months. Frequently the value type stocks have a dividend component that provides additional return for investors. 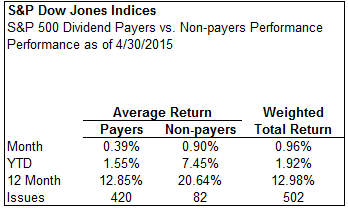 Further confirmation that dividend paying strategies have been underperformers can be seen below. 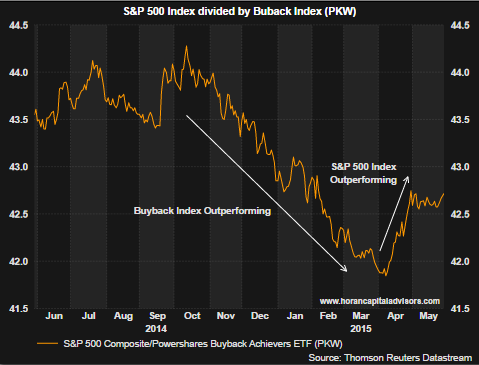 S&P Dow Jones Indices reports the average performance of the dividend payers in the S&P 500 Index have lagged the non payers by a wide margin, both year to date and over the course of the past twelve months as of April 30, 2015. For the one year period the payers return of 12.85% falls far short of the non-payers return of 20.64%.